The BMW 4 Series is more luxurious and attractive than its replacement, leaving us to wonder what’s to miss in the old 3 Series Coupe. What’s in a name? That question has become increasingly contentious amongst the BMW faithful, as BMW brass has taken a hacksaw to the brand’s nomenclature. The 3 Series Coupe, one of the most iconic German cars of all-time, has been discontinued for 2014, making way for its replacement, the BMW 4 Series. If the old car looked svelte like a tennis player, the new one is more of a gymnast. The new BMW naming scheme seems like a relatively simple formula: two-door cars – both coupes and convertibles – begin with even numbers, while odd numbers are reserved for more family-friendly sedans and wagons. As for sub-model coding, the larger the engine displacement, the larger the next two numbers in the number name code. Except, the BMW 6 Series is now offered in a four-door GranCoupé model, and the 1 Series remains a two-door coupe or convertible. Whoever said that Germans were a rigid, rule-based culture obviously had something mixed up – these rules are about as bent as they come. To get a better feel for this new name and take on a historically successful formula, we’ve flown to Seattle to play with the 4 Series, BMW’s newest sports car. The new 4 Series is more muscular than the car it replaces, but wears similar proportions to the outgoing 3er. If the old car looked svelte like a tennis player, the new one is more of a gymnast. There’s no question that you’re looking at a sports car – the hood bulge is just enough to suggest that there’s something powerful under that sheetmetal. There are functional brake vents built into the front quarter panels, and the profile of the car is pinched and creased handsomely from those vents all the way to the taillights. By comparison to the current 3 Series Sedan, the 4 Series is both wider and lower. That makes it look sportier from the outside, but it also makes the 3er look a little more luxurious and dignified by comparison. 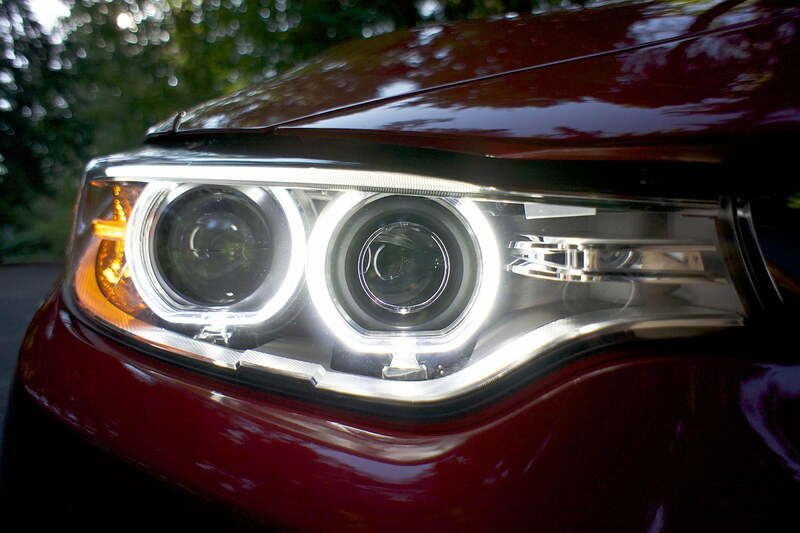 You can opt for full-LED headlights on the 4 Series, but xenons are standard across the board. 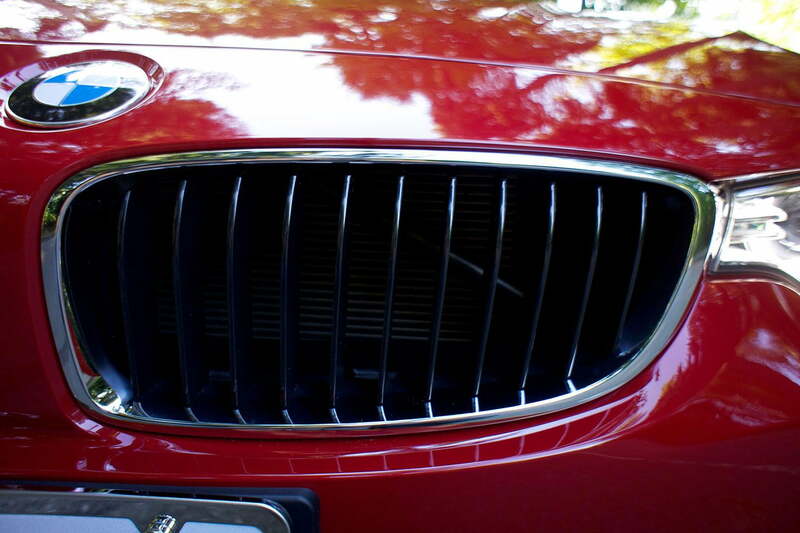 The lenses for the headlights are wide and narrow, extending all the way to the kidney grilles. That lean, athletic lighting scheme is repeated at the back of the car, where its LED taillights scoop down and inward from the car’s haunches to its tail. Dual exhaust tips are standard on all 435 models, while the entry-level 428 gets a single set of off-center pipes. 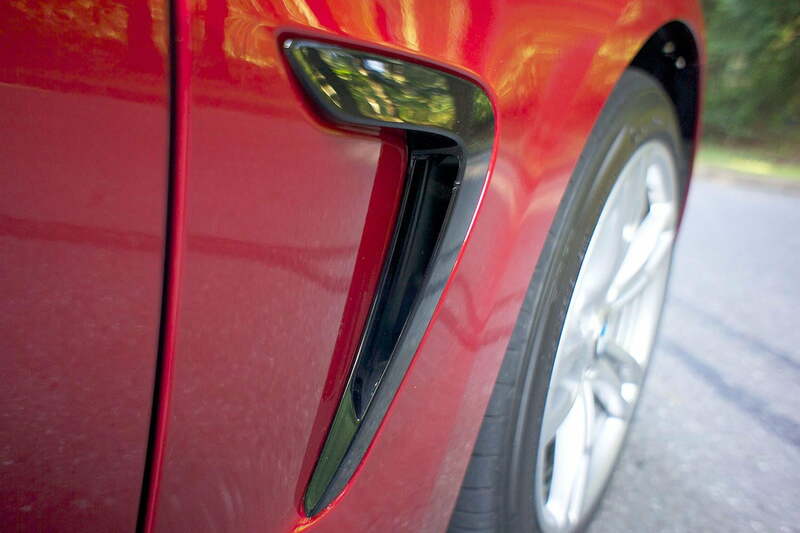 Up close and in person, we’re big fans of the new BMW’s sheetmetal – especially at the rear. The old 3 Series coupe seemingly tapered away like an afterthought at its tail. The new 4er has beefy haunches and a back-end that looks like a it’s keeping those rear-drive tires pinned to the asphalt. It’s a big a improvement through our eyes. Moreover, the 4 Series is just handsome in general, and we’re big fans of unnecessary (but tasteful) styling cues – like the headlights that pinch together at the grille – as well as some of the functional details. 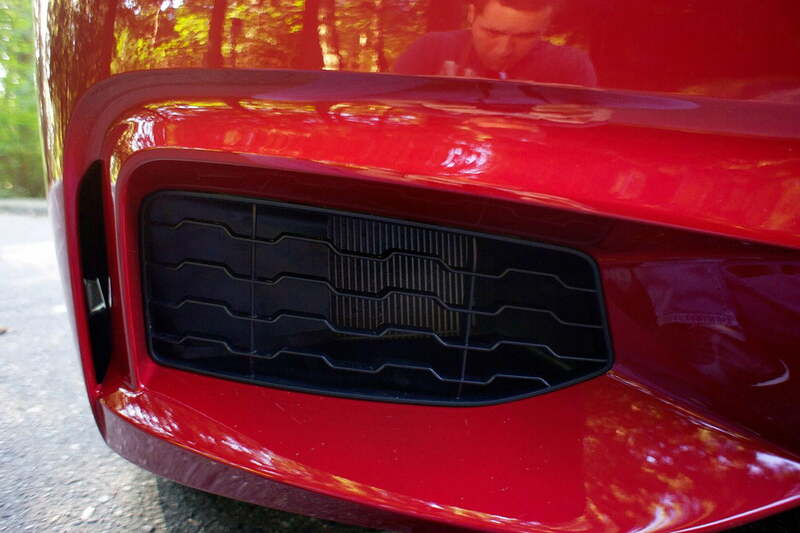 Take the fender vents for instance that actually help release heat from the brakes. 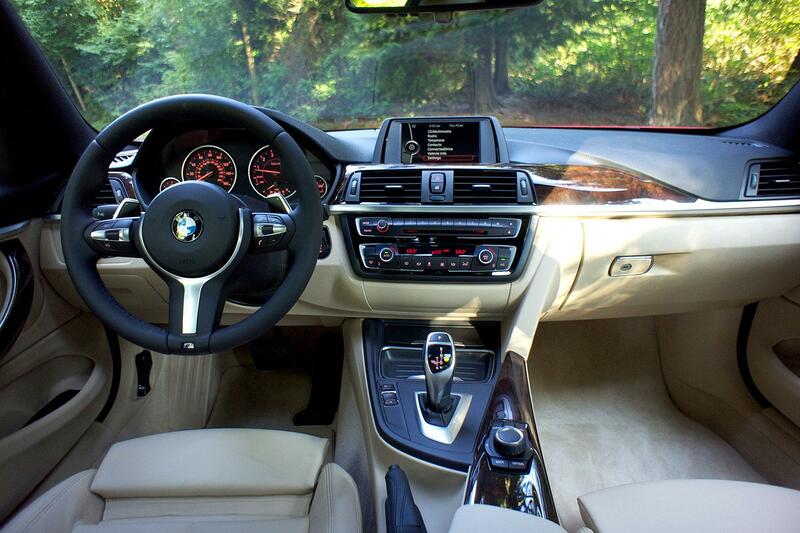 Inside, the 4 Series makes a huge leap over previous models. BMW has always been known for its use of high-quality materials, but the design frequently skews more in the direction of functional, rather than stylized. That changes for 2014. While leatherette (BMW calls it “SynsaTec,” which sounds like something grandma might cover her couch in) is standard on Sport and M Sport models, even that material is soft enough to feel expensive, while tough enough to hold up for the long haul. 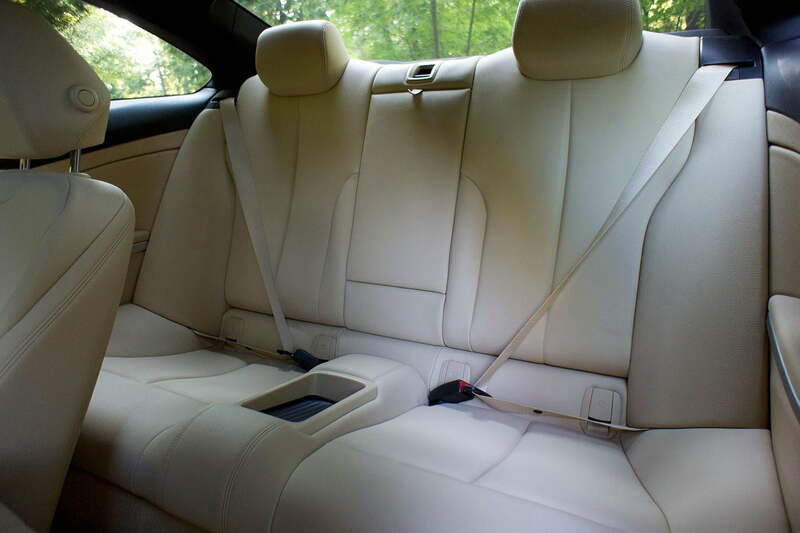 You can opt for leather in those trims, and it’s standard on the Luxury Line 428 and 435. The dash is asymmetrical and biased toward the driver, with the controls leaning slighting toward captain’s seat. 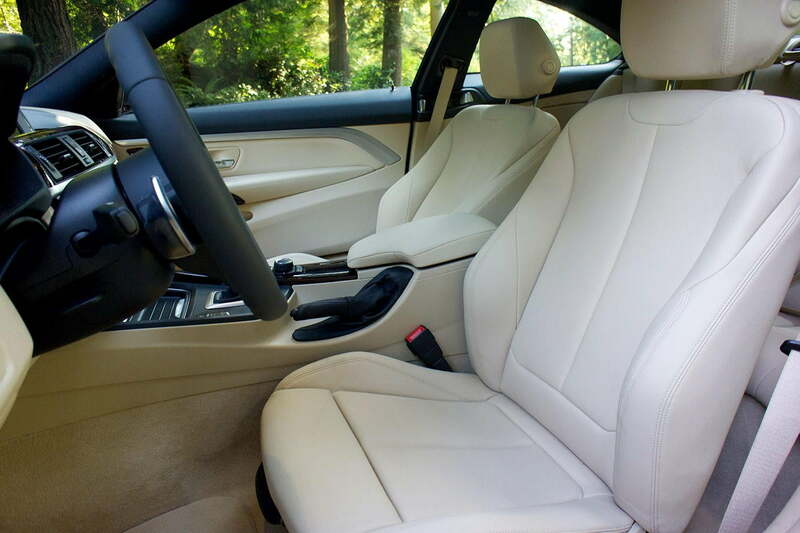 Where some previous interior designs have looked like they were manufactured en masse – and generically – for every BMW model, the 4 Series’ interior looks like it was designed specifically for this car. Plus, there are some fun trim pieces available. You can still choose from piano black, aluminum, or wood trim, but there are now colorful accents – blue, for example – available for M Sport models. The show-stealer for the interior is without question the newest version of iDrive. It’s better than it ever has been. That system controls the audio, navigation, and vehicle driving settings through a 6.5-inch center-mounted screen, and it’s faster and more responsive than any version of iDrive we’ve seen before. BMW even lifted Audi’s touchpad – integrated here in the center of the iDrive toggle – that allows navigation inputs to be scribbled in with your finger, rather than through scrolls and clicks. We’d also suggest that you select the M Sport steering wheel. While the standard wheel is fine, that M Sport option is one of the best in the business. The 428i is the entry-level model, and it’s powered by a turbocharged 2.0-liter four-cylinder that produces 240 horsepower. The next step up is the 435i with its 300 horsepower, 3.0-liter turbo six-cylinder, and there will eventually be a 400+ horsepower M4 on the market, too. Rear-wheel drive is standard on all models, but BMW’s xDrive all-wheel drive is available on 428 and 435 models. That means folks in snowier climates can choose a 4 Series that fits their needs, too. No matter rear- or all-wheel drive, every model has that sturdy, substantial feel that the Germans do so well. The 4 Series chassis – called the F32 – is essentially just a modified version of the F30 chassis on which the current 3 Series Sedan is built. The suspension is stiffened and steering is tightened on the 4 Series, making it significantly more fun to drive, even through minor tweaks. The 435i is a rocket – a rocket that wouldn’t have too much trouble getting to its electronically limited 155 mph top speed. Since there are two engines and two drive layouts available for both of those mills, shoppers will be left with a few choices to make. xDrive may help get your BMW around in inclement weather, but that all-wheel drive system is less sporty than functional – and it’s heavy – so it dulls the driving experience in all models. Even so, we’re talking about BMWs here, so even that dulled sense of fun is still more enjoyable than the comparable Mercedes-Benz C-Class with 4MATIC. If speed is what you crave, the rear-wheel drive 435i offers a pretty big punch. While its 300 horses may not sound that impressive, with every family sedan on the market offering nearly the same, we promise that the torque generated from the twin-scroll turbo is absolute money. Tune it to Sport+, and 435i is a rocket – a rocket that wouldn’t have too much trouble getting to its electronically limited 155 mph top speed. However, the rear-drive 428i is very nimble, very zippy, and it’s our favorite in the group. No, it’s not as fast as it could be, but we never found ourselves wanton for extra juice. Instead, we found this one to be energetic and charming. And starting at $40,500, it’s also the most affordable way to get into a 4 Series. By comparison, a maxed-out 435i with xDrive rings in at nearly $70,000. Clearly, then, options can get expensive in a hurry. Amongst the BMW lineup, the 4 Series is probably our new favorite sports car, especially in 428i guise. And, if you look at the competitive landscape – including the Audi A5 and Mercedes-Benz C-Class coupe – it’s the most fun, most current, and most stylish option on the market for 2014. If you’re looking up-market at a well-dressed 435i, you’ll find yourself dancing with a different crowd, and you may be able to find a nearly new BMW M3 or Mercedes-Benz C63 AMG for the same money. At that point, you’ll have to decide whether you’re more interested in racing, or in being a trendsetter. In our opinion, you can’t go wrong either way. The 2020 Nissan Versa sedan aims to deliver more style and tech than its forgettable predecessor did. Its restyled exterior borrows the look of the larger Altima sedan. But will the new Versa be more than just a pretty face? Nissan is celebrating 50 years of its iconic "Z car" with a special edition of the 2020 370Z. The 50th-anniversary model is dressed to look like a 1970s race car, but remains technically unchanged.